What are the politics of that restaurant? When is the best time to catch a cab? Why do you call part of Chinatown the Lower East Side? How can I be Pac-Man?! 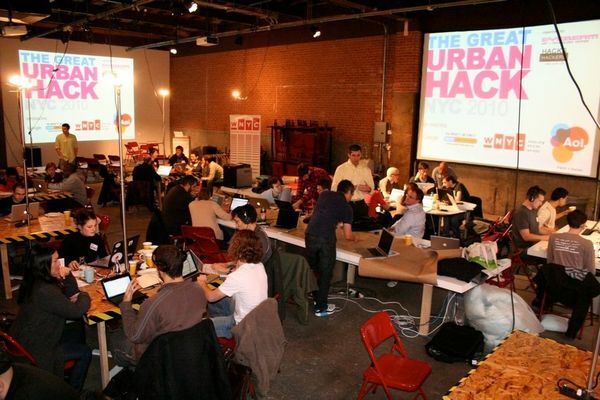 These questions are answered by the apps cranked out overnight this past weekend at The Great Urban Hack NYC. The mission for the 80 or so journalists and developers there was to design, report on, code and create projects to help New Yorkers get the information they need while strengthening a sense of community. It was open to themes around news, politics, government information, arts, culture or education — pretty much any journalism or technology project (going as far buying views on YouTube related topics) that might help residents connect to each other or the city. This project was inspired by Elizabeth Dwoskin’s article of the same name in the Village Voice, in which she describes New Yorkers as playing a “board game” to figure out who owns a given piece of property. The members of this team set out to actually make that task easier, online. The result is an interface, built on MediaWiki, that mines information from the city and state, and allows residents to add their own knowledge to the database. In this chat room, you can talk like a New Yorker. Only. And a famous one at that. Pick a character, from Jerry to Joey to Carrie, and start typing. As you do, you’re presented a list of related phrases that character has said on stage or screen — and you pick the most appropriate (or inappropriate). Team members were cagey about where they got all of the great phrases, which may have something to do with why the project hasn’t quite mastered its own domain (name). Want to pick your restaurants by their political leanings? This will be your answer. This team crossed campaign contributions with the owners of restaurants to see which places are supporting which candidates. They’re still working out the details, but you can see their latest code on Github. This team started by walking through the hackspace asking people about their favorite works of art, their favorite places in New York and a piece of clothing that defines them. They then set out to build thumbnail set of images to represent people. With those collages they hope to use social media to connect others with similar interests. This is a utility for generating thumbnails quickly with node.js to help coders “offload” creation of thumbnails from images by doing it in the browser. Check out the code on Bitbucket. This team played with a pile of NYC taxi fare data to find new ways to look at how, when and why New Yorkers use taxis. They came up with a few fascinating visualizations and dreamed up possibilities for new tools. Their biggest challenge: how to play with 16 million records (and that’s just one month of trips). This team is creating a community map of Harlem and Washington Heights, highlighting arts and artists in the area. They’re also building an interface so that people can use their phone to add art they see or know about in the neighborhood. Defining boundaries of New York City’s neighborhoods can be an inexact science — which doesn’t make computer programs happy. This project attempts to crowdsource the city’s neighborhood definitions first with a quiz, and then by highlighting spots where people disagree. The end result would be an organic dataset programmers can use to feed their hyperlocal apps. Wondering if StreetEasy’s new API — released for The Great Urban Hack — could also be helpful here. “Real people, playing real Pac-Man, on real sidewalks,” is how the creators describe this game. Here’s how it works (or will work): Sign in with your GPS-enabled phone and you’re Pac-Man. The dots you munch are lined up on the streets and avenues of Manhattan, and you need to run — literally — down those routes to “eat” them. But watch out for ghosts — other players trying to get you. Spot them by looking at your phone, which shows your location and those of the ghosts nearby. The team said the civic purpose is exercise and community. And fun. It’s not quite done, but you can sign up to find out when it is. Wakka-wakka. Turns out Sutton Place and the East 50s are a lot like Belgium … when you map every country’s relative wealth onto the zip codes of New York. This experiment compares aggregate New York City tax return information by zip code with World Bank economic data for the wealth of countries. See the results in this PDF (scroll down for the entire city). This is a concept/design for a tool that would help journalists present visual information in their stories, including photos, timelines and data. It was developed by a group of non-coders who wanted to bridge the journalist-technologist gap. Next step is getting it built, and they’re looking for folks who are interested (contact me or Chrys Wu via Twitter if you are). All together, a pretty impressive amount of work done in very little time. It was also clear that new friendships, collaborations and connections were built along with the applications, and those will no doubt lead to further projects in the weeks and months to come. The Great Urban Hack SF took place at GAFFTA in the Tenderloin around the same time, and we actually video conferenced via Skype, which was very fun. And the response from participants was great — good people, good food and good space are elements to an epic hackathon.